Zelkova serrata, Japanese Zelkova or also called the Japanese Grey-bark Elm is a tree originating from cool-climate areas of Western Asia to China and Japan. In nature, it grows 90 to 100 feet tall with a 60 to 80 foot spread. Zelkova is massive, with the trunk capable of growing to four feet or more in diameter. 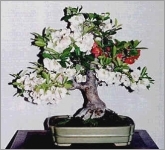 Zelkova is suited to almost all bonsai styles. They are deciduous bonsai with small ovate, serrated, pointed leaves. 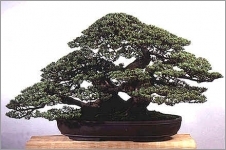 Some even call them one of the best deciduous trees for bonsai. Although they are related to the elms, they do not encounter the same diseases and in many cases are being used as elm-substitutes. Leaves are 1.5 to 4 inches long, turning a brilliant yellow, orange, or burnt umber in the Fall. In Winter they produce small, greenish flowers that have a slight perfume. The Grey-bark Elm is usually shaped exclusively by pinching and pruning, but wire can be used. To reduce leaf size, healthy trees can be leaf pruned in early Summer. All of the leaves are removed, leaving only the leaf stems on the branches. The tree will respond by putting out a second set of leaves, smaller than the first set. The straight trunk and smooth bark of the Zelkova are other appealing characteristics, maturing from green to grey in colour. Be careful when wiring and handling Zelkovas, its branches are thin and fragile. Wiring should be done in the Summer. Japanese Zelkova are valued for many reasons but especially because there are many equally balanced branches.